After viewing the restaurant and menu we went upstairs because we had heard that a replica of the Titanic had been built by the employees. Not only did we see their Titanic, but we also noticed the bar was built around a replica of a tugboat called The Mary Ellen Carter. They have a large carpeted deck outside with tables and umbrellas. The marina was very scenic from this perspective, and I couldn't take enough pictures. 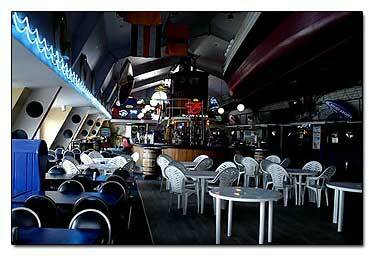 There is a large screen TV, and this area could easily accommodate a party. The directions to Captain's Cove are simple. On I-95 from north or south, Exit 26 to Bostwick Ave. following their well placed signs. 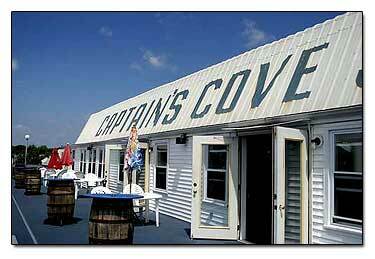 Captain's Cove is also close to the Ferry and Memorial Seaside arch and the Bridgeport beach, so you could visit there too.